"The turbine provides a great deal of my power use, and sometimes more! Using it to run the heat pump keeps the house heated much cheaper than any alternative." Customer was keen to install a generator as part of his self build home in order to generate power to run his ground source heat pumpT. A wind turbine was selected to make best use of the resource available on the windy site in South West Scotland. To cater for the customer’s budget and electrical requirement, and considering the nature of the site, we chose the highly robust Proven Energy 6kW wind turbine. Generation of around 14,000kWh saving around 6,000kg of CO2 per year. 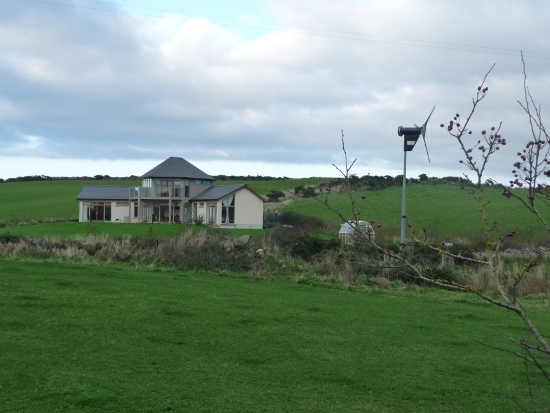 The turbine will also run household appliances and the customer’s ground source heat pump. Installation took 7 days to complete, including cabling, electrical installation and civil works. We also provided assistance on grant funding, planning permission, as well as full design install and commission service, including grid connection approval paperwork. We also carry out maintenance and technical support for the customer.